Earlier this month, colleagues from around the country scoured toy aisles across the country for kids’ products containing fragrance or ingredients made with the chemical styrene (see table below). Now, the 51 products they purchased are at an independent, certified laboratory to be tested for volatile organic compounds (VOC’s). We’ve also sent more than 14 face paint kits to another lab, where 48 of the different shades and colors will be tested for heavy metals such as lead, cadmium and mercury. This is part of a label-reading and product testing investigation that is a sequel to our 2009 Pretty Scary report on heavy metals in kids’ facepaints. VOC’s include chemicals like styrene, toluene, benzene, and formaldehyde that off-gas into the air. These vapors and gases are part of what make everything from perfume to paint to gasoline emit a scent. Many consumers seek VOC-free paint, but VOC’s are everywhere. Some VOC’s are naturally occurring—they are in plant oils and leaves, giving forests and flowers unique smells. Some VOC’s have health concerns—benzene, for instance, is a known carcinogen, and toluene is a reproductive toxicant. 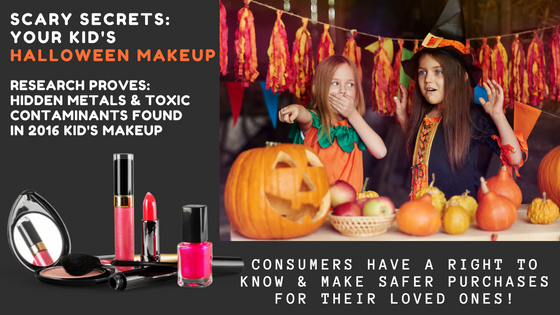 Heavy metals like lead, arsenic, mercury, cadmium and chromium are found in a wide variety of personal care products including lipstick, whitening toothpaste, eyeliner and nail color. Some metals are intentionally added as ingredients, while others are contaminants of other ingredients. Exposure to metals has been linked to health concerns including altered brain development, learning difficulties, reproductive, immune and nervous system toxicity. Both labs will use validated methods to test for trace amounts of metals or VOC’s. In many cases, they will have to dilute the samples to run them through the laboratory machinery; otherwise, various sudsing agents, oils, and solids can gum up the machines. We expect both labs will be able to find trace amounts of metals or VOC’s in the parts per million range. The Learning Disabilities Associations are waiting to see if any scary ingredients are in products from Dollar Tree, Family, Dollar and Dollar General. We are proud to be a part of this project by the Breast Cancer Fund and other partner organizations.